My colleague and friend Brent Williams left a copy of the New York Review of Books at my cube just before Thanksgiving. 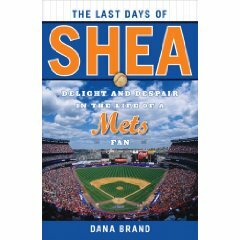 He specifically wanted me to read a review of the book, The Last Days of Shea: Delight and Despair in the Life of A Mets Fan. Written by Michael Kimmelman, the review is titled At the Bad New Ballparks. Essentially, Kimmelman argues that new stadiums, like CitiField, the park built to replace Shea Stadium, are simulcra. Though they look like stadiums long-since relegated to photographs – CitiField, in fact, is meant to evoke the old Ebbets Field – they come complete with shopping malls and dining centers and scoreboards that tell us when to stand, when to cheer, where to look. There is no space for silence, no time for the contemplative moments. And let’s face it, there has always been the potential for a lot of contemplation at baseball games. Or at least there used to be. Murakami wrote his first fiction when he was 29. He said he was inspired to write his first novel, 1979’s Hear the Wind Sing, while watching a baseball game. In 1978, Murakami was in Jingu Stadium watching a game between the Yakult Swallows and the Hiroshima Carp when Dave Hilton, an American, came to bat. According to an oft-repeated story, in the instant that Hilton hit a double, Murakami suddenly realized he could write a novel. More importantly, these ersatz stadiums, as Kimmelman calls them, though architecturally evocative of the past, don’t honor the complete history of our teams – the blemishes, the failures, the faults, the things that make many of us want to root for a team. I read the review with fascination. I have to say, I love AT&T park, one of these new stadium simulcra. I’m sure I would on some level enjoy CitiField, too. I know I’ve often described the now-demolished Shea Stadium as a huge concrete parking garage with the center carved out and a grassy area plopped down in the middle, so in my thinking, any replacement would be better. But after reading the review, I realized that my memories of Shea are not about designated play areas or luxury suites or television lounges. They are of rain delays and huddling under the overhang if we were lucky enough not to be in the upper deck; embarrassment at having to pee in troughs next to old men; the garish mets colors, blue and orange, that hung in huge patches on the exterior walls of the stadium; singing Meet the Mets, Meet the Mets, Come on out and greet the Mets, before every game, along with the freakish-looking, baseball-headed Mr. Met mascot. I realized that as much as I malign Shea, it was flawed. Just as the team I loved was. Just as I am. Just as the game is. As long as the World Series lingers (thank you, Phillies), I’ll continue to give myself permission to post about baseball. In 1977, the All-Star game was played at Yankee Stadium. My brother Sam and I, along with my friend Kurt Nunez, decided to get bleacher tickets. So we hiked up to the Bronx in the middle of the night to be one of the first people on line. To make sure we got seats for what felt like a once-in-a-lifetime kind of experience. I don’t remember much of the game (though I do remember those long droopy mustaches, like the pitcher is sporting in the poster to the right). But I do recall batting practice. We got to the stadium early enough to watch the players hit moon shots into the stands. I remember in particular Fred Lynn, the often-injured but perennial all-star center fielder for the hated Boston Red Sox. During his batting practice hacks, Lynn lofted a ball that seemed to be coming right at me. It landed a few rows in front of where I was sitting, close enough for me to rush to the spot, close enough to spot the ball on the cement floor, close enough to see someone’s hands wrap around the ball, then hold it aloft like a trophy. Lynn was a defensive standout and had an amazing rookie year in 1975 for the Red Sox, winning both the Most Valuable Player award and Rookie of the Year. What I remember most about Lynn, though, is not his grace or his power, but the formidable outfield he was part of, an outfield that included Jim Rice, one of the great and consistent power hitters of our generation. They were an interesting combination, Lynn and Rice – who both came up in 1975 as rookies. One white (Lynn), the other black (Rice). In Boston, players have said, being black was not always conducive to kind treatment. Boston, after all, was the last team to integrate, and that came about in 1959, a full 12 years after Jackie Robinson played his first game for the Brooklyn Dodgers. That was the narrative I knew as a kid – that Lynn somehow received favorable treatment compared to Rice because he was white. All that was forgotten, though, in the moment that Fred Lynn’s ball arced into the sky and then grew larger as it – much to my amazement – headed right towards me. I called my dad today. He started our conversation, as he always does, by telling me we had a bad connection. When in reality, my dad needs hearing aids but refuses to get them. My dad’s auditory denial drives my brother Sam crazy. Me? I feel like when you’ve lived 80+ years, you’ve earned the right to do pretty much anything you want to do, include force your children to talk very loudly into the phone on occasion. I call just as Game 4 of the World Series is beginning. “Yankees Phillies,” my dad says. He read in the paper, he tells me, that the last time the Yankees and Phillies met in the World Series, the year was 1950. My dad remembers that World Series. Not because he was a Yankees fan, or a Phillies fan, or even a baseball fan. He remembers that series because he was working as a translator for American G.I.s during the Korean War. There was baseball news in Stars and Stripes and broadcasts of the games on shortwave radio. My dad had heard of the Yankees – and New York City, of course – but had no idea what baseball was or that there was a place called Philadelphia. He could translate words, but he didn’t know the culture. My dad remembers that one American soldier referenced Nelson Rockefeller, the oil-family scion and soon-to-be governor of New York State. Rockefeller, the G.I. said, had enough money to buy Korea. My dad tells me he didn’t doubt that was true, given that Korea, months into a war that raged up and down the peninsula, was a bombed-out shell of its former self. North Korea invaded South Korea on June 25th, 1950. The day before, the Phillies, affectionately known as the Whiz Kids, pulled a game behind the Brooklyn Dodgers in the race for the National League Pennant. They would eventually overtake the Dodgers and clinch on the last day of the season. Throughout the summer, the North Korean army pushed south, all the way to Pusan, which sits at the tip of the peninsula. The U.S. then pushed back. By October 1st, 1950 – three days before the start of the World Series – the North Korean Army was forced back over the 38th parallel (which is today still the dividing line between the two countries). On Oct. 7, the Yankees completed their four-game sweep of the Whiz Kids. The next day China entered the war. For the next three years, the Korean War continued – a stalemate, essentially – with massive casualties on both sides. Afterward, my family immigrated to the U.S., largely because my dad received a sponsorship to study here – the result of his work as a translator and befriending an American soldier. He never expected to stay, always assumed he’d return to Korea once he finished school. But here he is, following the Yankees and Phillies in another World Series. This unlikely arc makes my Dad laugh. Eventually, we say good bye. And he goes back to watching the game.